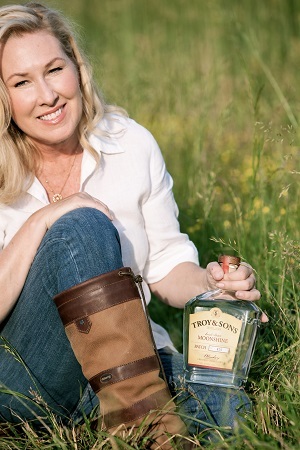 Troy & Sons Platinum whiskey is billed as the “first true American Moonshine”, I can believe that this IS the stuff that the moonshiners kept at home, instead of selling down the road. And likely one of the reasons they didn’t leave home, but I digress. I’m originally from back East – I’ve tried ‘shine. Apparently I was getting the road ‘shine, because it tasted like roadkill, not matter what fruit floated in it. But Platinum is lovely – it’s also distinctly different from some of the others I’ve tried that have popped up in recent years. Here are my notes – sláinte! Color: Clear as the mountain stream that I’m sure must be somewhere nearby. Nose: There is zero burn to the nose of Platinum. None. There’s a sweetness that’s very present, but not overpowering. Some of you may pick up a hint of a tequila smell, which I’ve noticed before in other moonshines. I also noticed a hint of grape to the sweetness. All in all, a very intriguing smell. Taste: The sweet from the nose does carry through, but it has just enough kick that it’s not cloying. Another pleasantly smooth whiskey, which is another unusual characteristic for moonshine. Troy only uses the hearts of the distillate, which shows. (for more on that, visit Liquor 101). Overall, a great taste and something that would mix well in a variety of cocktails. Check out Troy’s suggested recipes. Price point: (online) $29.99 Comparable to other moonshines. Other notes: Troy & Sons Platinum is the only whiskey in the world made with Crooked Creek Corn. Paired with pure Appalachian spring water, this moonshine….shines. Check it out now! Three out of three – nicely done!